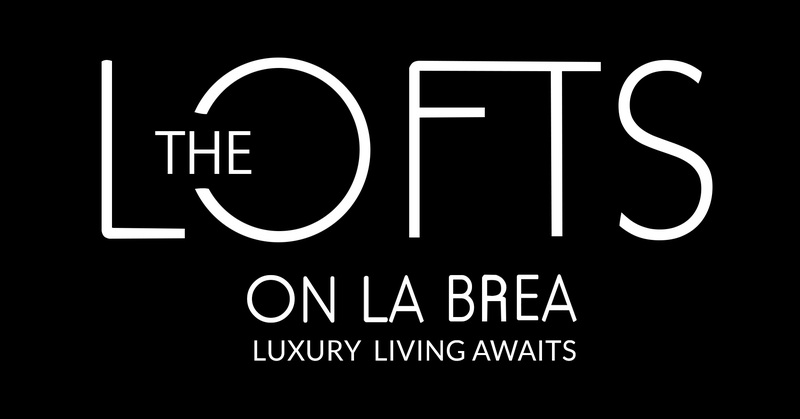 The Lofts on La Brea offers a variety of studio and one-bedroom floor plans in loft and penthouse options. We also offer furnished corporate units. Every floor plan is open and spacious with plenty of natural light and spectacular views. Features include high or 16-foot ceilings, private balconies, kitchens with movable islands, modern bathrooms with suspended vanities, and energy-efficient lighting. 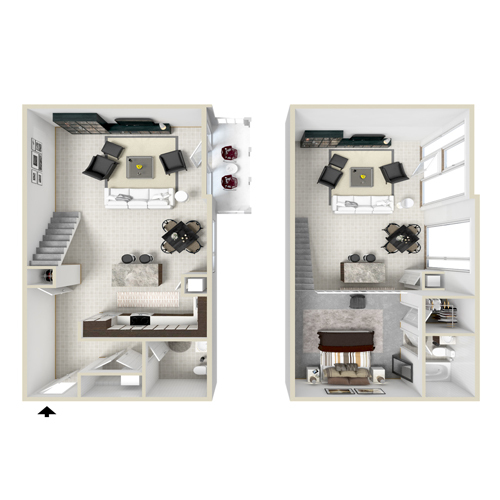 This one bedroom, 1.5-bath loft has 970 square feet of living space. The lower level has an open great room, an L-shaped kitchen with island, a utility room, and a half bath. The L-shaped balcony wraps around the corner of the apartment with two doors leading out. The upper level contains the loft space, a large closet, and a full bathroom. 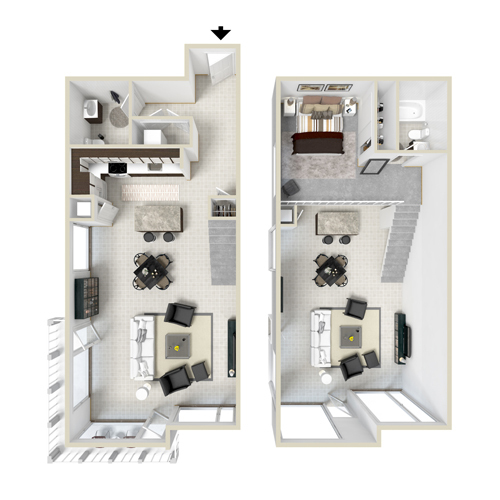 The Penthouse Jr. is a one-bedroom, one-bath apartment with 755 square feet of living space. This apartment has an open living area that opens onto the balcony. The L-shaped kitchen includes an island. The open bedroom area contains a large closet. 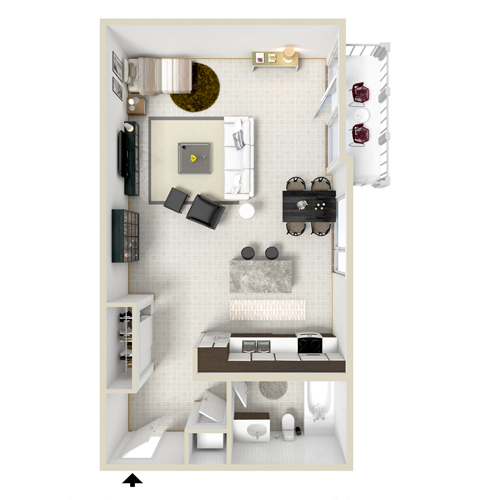 This is a studio apartment with one bathroom and 845 square feet of living space. It has a separate foyer, a closet, and an open kitchen with island. The L-shaped balcony wraps around the corner of the apartment and has two doors. At 970 square feet, this one bedroom, 1.5-bath bath loft apartment is open and spacious. The lower level features a huge living area, a half guest bath, two closets, and an open kitchen with island bar. The lower level also has access to the balcony. The upper level contains the loft space with closet and full bathroom. This studio apartment has one bath and 780 square feet of living space. This penthouse apartment is very open, with a large living area and kitchen with island. There are two spacious closets and a large balcony. This loft has one bedroom and 1.5 bathrooms. The lower level has two balconies, an open living area, an L-shaped kitchen with island, a utility room, and a half bath. The loft includes a walk-in closet and full bathroom. This apartment has 925 square feet of living space. 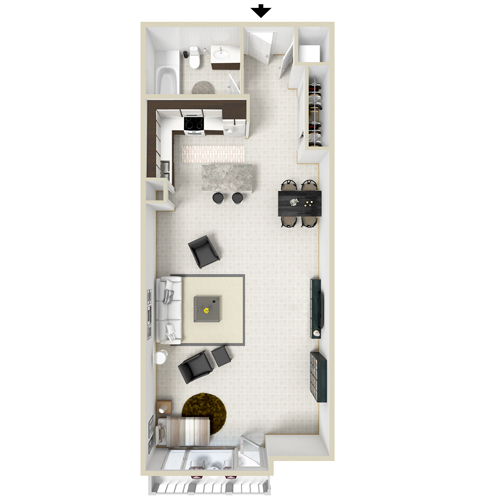 With 705 square feet of living space, this is a spacious studio apartment. It includes an open living area with kitchen and island, a closet, and a full bathroom. A balcony provides outdoor living space. This one-bedroom, 1.5-bath loft has 945 square feet of living space. 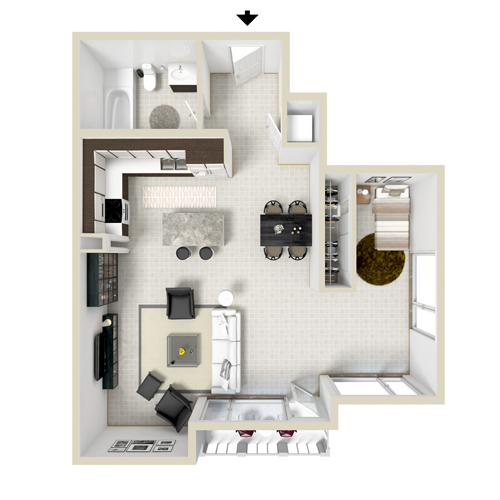 The lower level contains an L-shaped kitchen with island, a utility closet, and the half bath. The open living area has access to the balcony. A coat closet is located off the foyer. 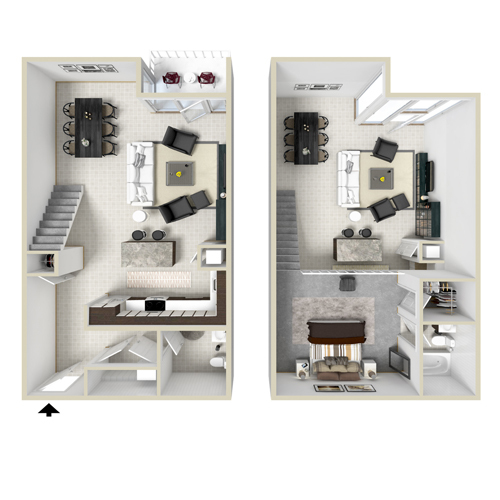 The loft space includes a walk-in closet and full bathroom. 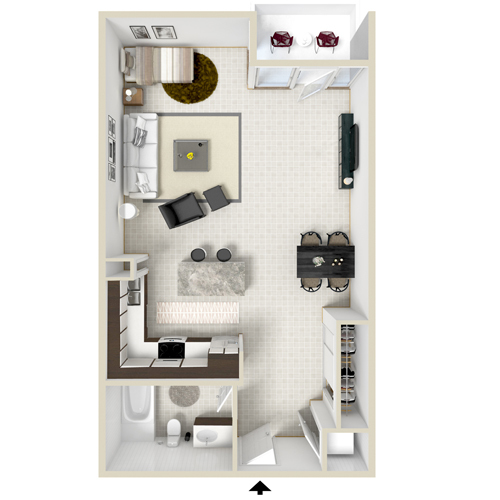 This studio apartment has one bathroom and ranges from 675-935 square feet of living space. This penthouse apartment includes an L-shaped kitchen with island, a large closet, a full bathroom, and a balcony. 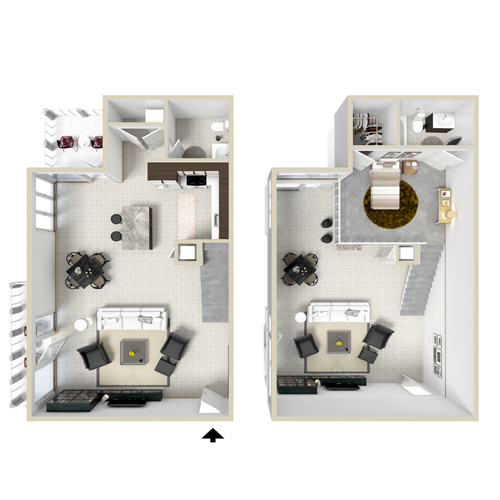 The Type E lofts range from 845-1,120 square feet and have one bedroom and 1.5 bathrooms. 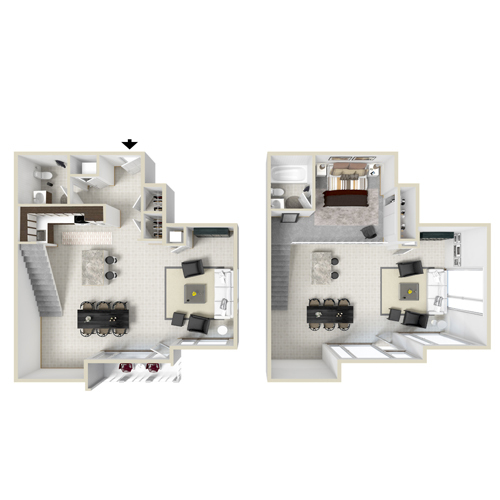 The lower level includes the utility closet, half guest bath, coat closet, L-shaped kitchen with island, and access to the balcony. The upper level contains the loft with walk-in closet and full bathroom. This 720-square-foot studio has a large living area, spacious patio, and an L-shaped kitchen with island. There’s also a large closet, full bathroom, and utility closet. 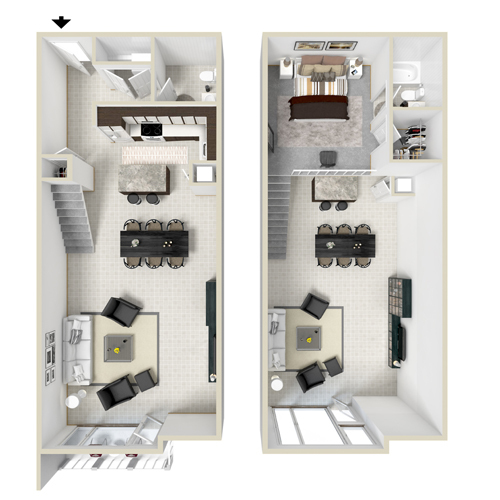 This one bedroom, 1.5 bath loft has 965 square feet of living space. 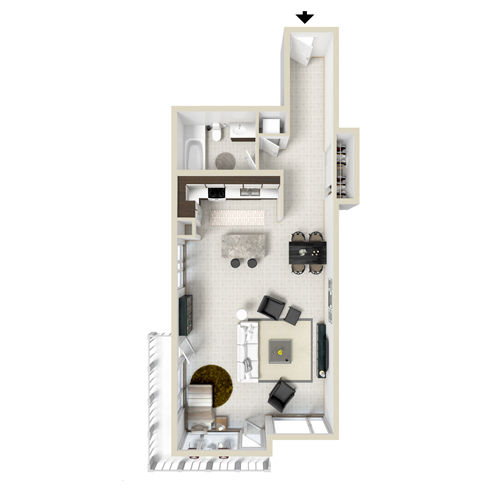 It includes a large utility closet, a foyer with coat closet, a half bath, an L-shaped kitchen with island, and a spacious balcony on the lower level. 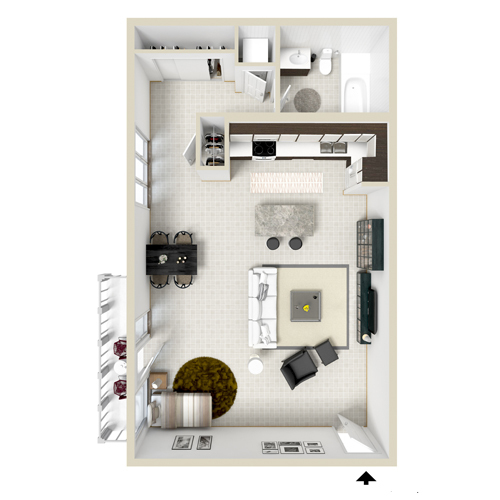 The loft level includes a full bathroom and a walk-in closet.